Published Jun 30, 2017 By Julia 12 CommentsThis post may contain affiliate links. 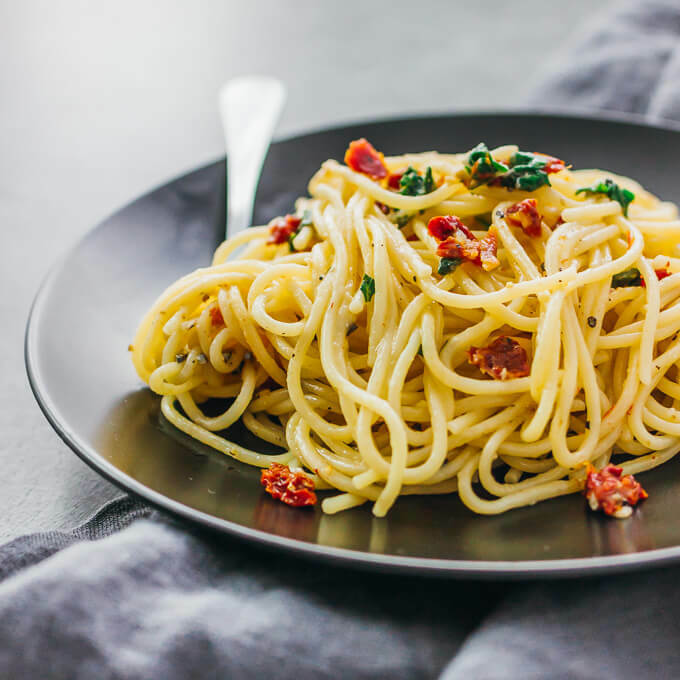 Spaghetti aglio e olio is one of my favorite simple, vegetarian pasta dishes: spaghetti noodles with grated parmesan cheese and diced sun-dried tomatoes, all cooked in one pot. Spaghetti aglio e olio means spaghetti with garlic and oil in Italian. 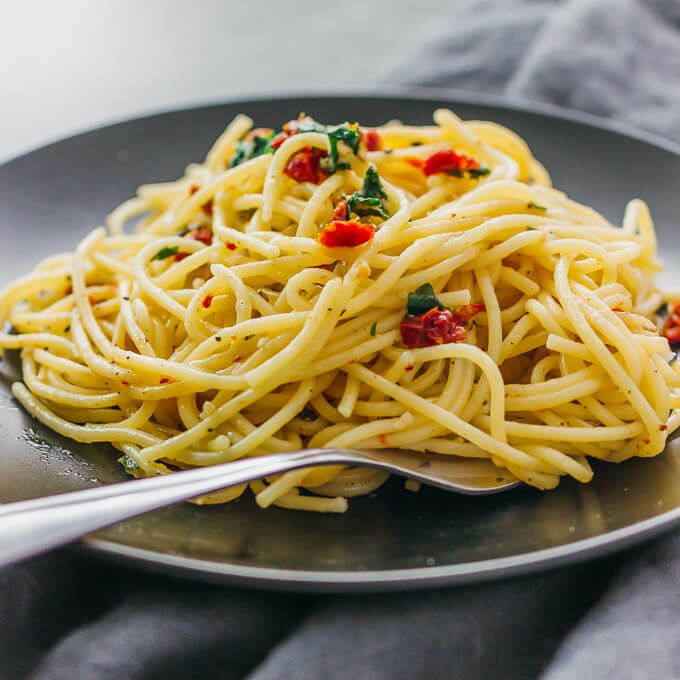 It’s usually cooked by first sautéing minced garlic in olive oil and then mixing with spaghetti, grated parmesan cheese, red pepper flakes, and parsley. This is one of my favorite simple pasta dishes — I’ve already made it twice in the past few days — and its pasta sauce (if you can even call it that) is merely comprised of melted parmesan cheese and pasta water. The sauce has no cream and there isn’t even any salt in this recipe. You don’t need any salt, even in the cooking of the pasta, and you won’t miss it at all. Just enjoy the natural flavors from the ingredients, which taste fantastic. No red pepper flakes. I love my spicy foods (mmm spicy deviled eggs and bacon wrapped jalapeño peppers), but this is one of those dishes where any spiciness would overwhelm all of the other flavors going on. I want to be able to really taste all of the ingredients without distraction and so my version of aglio e olio is not spicy. One pot only. All of the other recipes that I’ve seen for aglio e olio ask that you cook the spaghetti noodles in a separate pot of boiling water. I make everything in the same pot, including the spaghetti, so you don’t need to wrangle more than one pot for this recipe. The added benefit of this? The pasta water, or water used for boiling and cooking the pasta, is automatically re-used to form the pasta sauce for the spaghetti. Sun-dried tomatoes. Mr. Savory Tooth and I are huge fans of sun-dried tomatoes so I always use them when I make aglio e olio. I love the extra burst of tart flavor, not to mention how it adds a nice pop of color to the finished dish. This recipe yields two good-sized servings — great for Friday date nights at home or any occasion where you want a simple romantic dinner. Yes, there is a good amount of garlic in this dish, so maybe it’s not the most romantic dish that you want to serve on Valentine’s Day, but if you and your partner are garlic junkies like myself and Mr. Savory Tooth, it’s all good. I use spaghetti type pasta for this recipe, so the cooking time estimate below is specifically for spaghetti. If you use a different type of pasta, your cooking time will differ. I recommend using thin noodles only so that it doesn’t take long to cook. 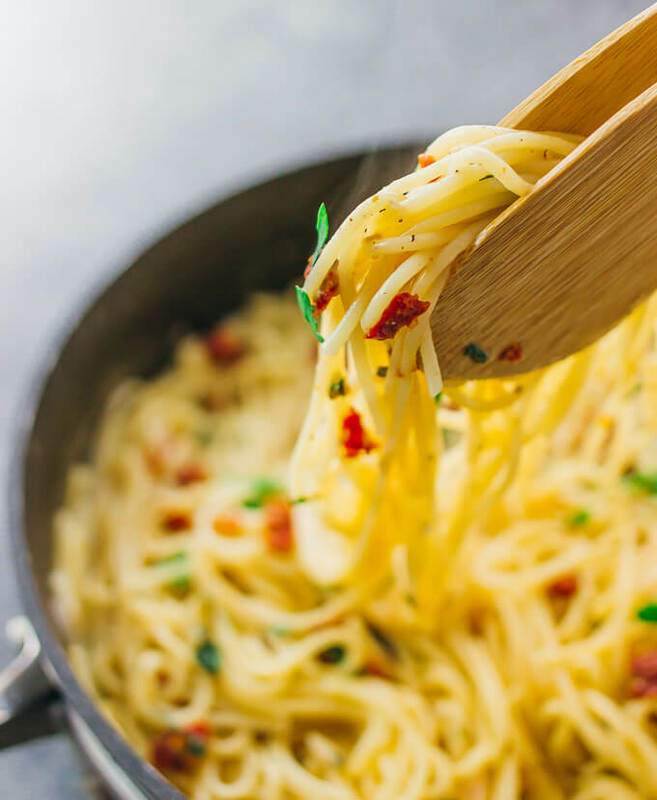 If you use angel hair pasta, you may only need to use about 3 cups of water and 5 minutes to cook the noodles. This dish is best eaten while hot. Once it cools, the noodles will become sticky since it’s covered with parmesan cheese. You want to eat it while it’s hot and the noodles are still silky smooth. Keep the dish on a burner to keep it hot if you’re not serving immediately. 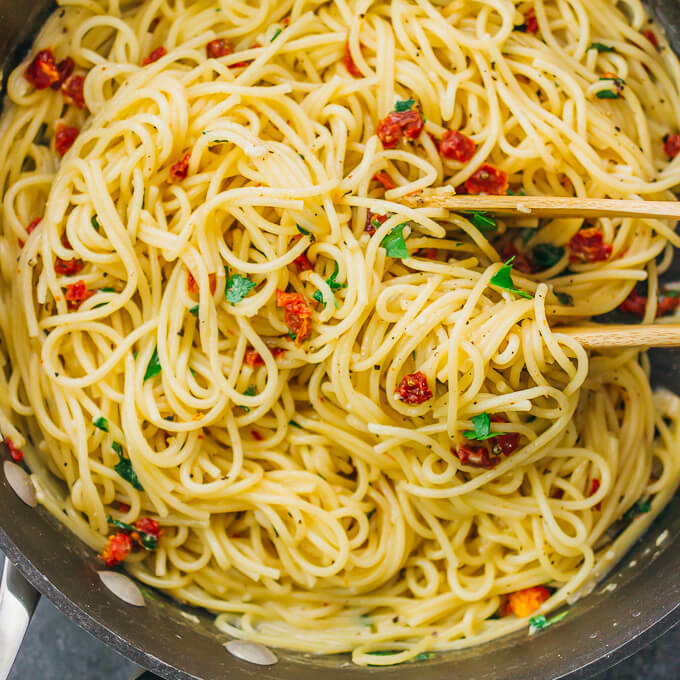 You can eat this spaghetti on its own, or pair with a nice Greek salad or crusty bread. If you’re looking for a heartier accompaniment, I recommend serving it alongside chicken parmesan or pork chops. 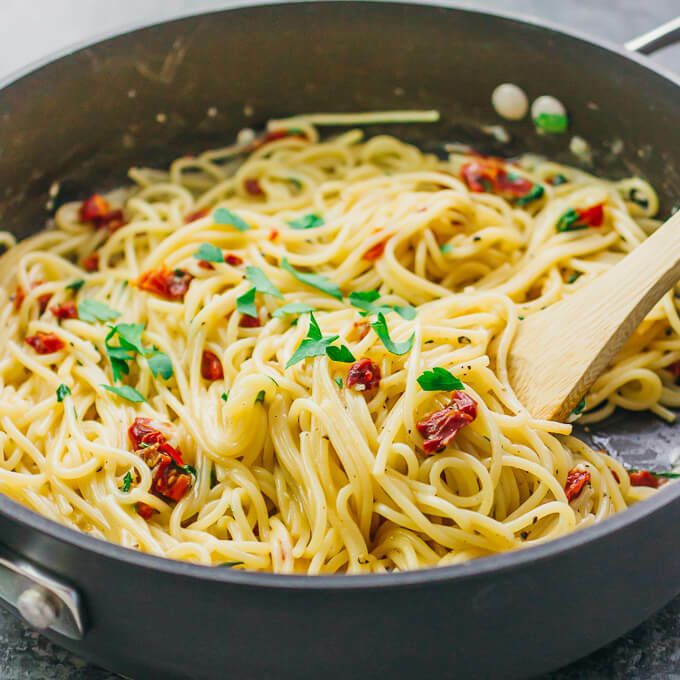 Spaghetti aglio e olio is a simple pasta recipe with parmesan cheese and sun-dried tomatoes, all cooked in one pot. Add olive oil and garlic to a 3 quart or larger pan. Cook over medium heat until the garlic is browned, a few minutes, stirring occasionally. Add 4 cups of water and the spaghetti to the pan. Bring to a boil over high heat. Cook until spaghetti is tender, about 10 minutes, stirring occasionally. Decrease the heat to medium. Add parmesan cheese, sun-dried tomatoes, parsley, and pepper. Stir until the cheese has melted. Serve immediately while hot. This is definitely not low carb. There’s a note on the top of the post explaining this. Question: After the spaghetti is cooked o you drain the water from the pot before adding the other ingredients? No, you keep the water in the pan, which becomes part of the sauce. This recipe sounds and looks so good. I can’t help but to think that it would be a bit watery since you don’t drain it. Does the parmesan cheese prevent that? It’s not watery because the dry spaghetti absorbs water as it cooks, there’s also evaporation going on for 10 minutes over high heat (Step 2), and the parmesan helps thicken it up. Thanks for sharing! Can’t wait to try this tonight. The indicated 530 kcal is for per serving or the whole pot (2 serving) ? The calorie information is per serving. Let me know if you have any other questions! It`s hard for me to work with ounce, Is it possible to indicate weight. Hi Maria! Ounces are a unit of weight. In this recipe, 8 ounces spaghetti = 227 grams. Hope that helps!